I've been taking a short break but whilst I was away the good folk at Econsultancy published a report that I'd been working on focusing on the convergence of two topics that have never been more important to just about every company: Agility and Innovation. The report pulls together feedback from a range of interviews I conducted with senior marketers, practitioners and academics and is part of the ongoing series of projects I've been involved with with Econsultancy as part of their growing Digital Transformation practice (alongside work into Digital Marketing Structures and Resourcing, and some more to come later this year and into next). The full report is subscriber only (Econsultancy has a membership of over 200,000 digital marketers so I'm guessing a good proportion of loyal readers will be members anyway) but there were some fascinating themes that emerged including some pretty significant barriers and challenges, but also potentially big areas of opportunity. The overarching finding supports something I've been saying since I first started talking about the subject almost five years ago, namely just how broad an opportunity improved organisational agility presents in the potential to accelerate rates of innovation, boost efficiencies, and enhance customer expeience. 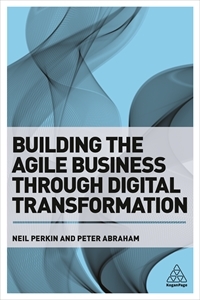 But this goes way beyond the adoption of agile development processes within technology teams and real-time marketing tactics and techniques. It's an opportunity that can only be truly realised through a broad based approach to innovation and a fundamental review of behaviours, approaches, skills, processes and even organisational structures. As part of their focus on Digital Transformation, Econsultancy will also be running an event in London on 13th November for senior level marketers at which I'll be giving a talk so I'll see you there if you're coming to that. In the meantime, on a related theme, the smart people at AdaptiveLab invited me recently to give a talk on organisational agility as part of their event on turning media disruption into opportunity. It's a short talk touching on a number of the subjects I've been mildly obsessing about here and elsewhere. Hope you find it useful.